Solo yachtsman in difficulty given assistance by Lytham St Annes volunteer lifeboat crew Lone sailor brought ashore by the RNLI Sea Rescue Charity’s Lifeboat. Setting out from Fleetwood on 21st March 2015 to enjoy a leisurely sail home to mid Wales, an elderly yachtsman found himself in trouble when his 9.5 metre (31 foot) auxiliary yacht ran aground in the mouth of the Ribble Estuary on Saturday afternoon. Various problems with the yacht including a fault with the engine and the auto pilot contributed to the vessel stranding a mile south of the Lytham St Annes Coastguard Station building on North Beach car park. Photo by Ben McGarry- Lytham St Annes Lifeboat Her Majesty the Queen alongside the grounded yacht with volunteer Lifeboat crew member Avril Trevorrow attending to the anchor chain. Holyhead Coastguard requested the launch of the Lytham St Annes Mersey class all-weather lifeboat to give assistance and the crew were paged at 4.19 pm. 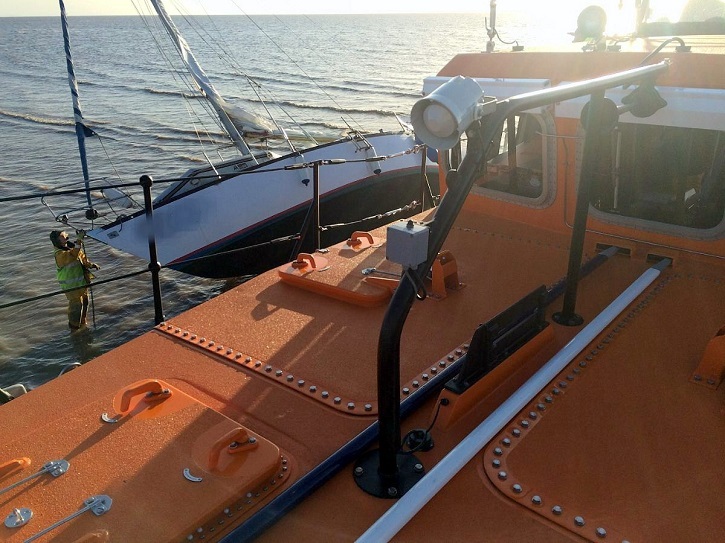 The lifeboat set out as soon as the crew had assembled but found the yacht already in shallow water and, being a fin keel vessel, already starting to list on to her starboard side. The lifeboat Her Majesty the Queen went alongside and waited until the yacht was fully aground before the volunteer crew members laid out the yacht’s anchor in readiness for the next high tide. The owner of the yacht was brought into the lifeboat and taken ashore at 5.30pm to warm up and wait until the yacht was due to re-float. On Saturday evening Lytham St Annes Inshore Lifeboat (ILB) Sally was launched to return the yachtsman, and then tow the vessel to a safe anchorage off Starr Gate from where the man planned to sail in daylight back to Fleetwood. The ILB returned to her station after two hours at sea. A third service call to the same vessel started the following morning when the owner called Holyhead Coastguard requesting help when he could not start the engine. The volunteer lifeboat crew were paged at 9.41 am and the ILB was taken by road to St Annes and launched there. In good conditions the Sally took the yacht in tow and headed north at the same time requesting Fleetwood Lifeboat launch to take over the tow for the final entrance to the River Wyre. The ILB had reached Rossall when the Fleetwood Lifeboat arrived and relieved them of the casualty. The ILB then returned to station and was ready again for service by 12.35 pm after cleaning, checking and refuelling had been completed. Crew member Ben McGarry later said that it became necessary to get the yacht to a place of safety as one thing after another seemed to be failing on the vessel as time went by.